In this remake of the 1941 movie (with Lon Chaney, Jr. & Bela Lugosi), one of the most evident and obvious differences is the astronomic advance in special make-up & digital FX in the subsequent seven decades since that version scared audiences into a panic. But, with these advances and realism also come a more complacent and hard to please audience that do not scare as easily as they used to. It is Victorian-era Britain. Lawrence Talbot, an American actor who grew up in England, visits his homeland on a stage tour. On getting word of his brother's disappearance, he returns to Blackmoor, to the opulent but decaying homestead of his birth (where disturbing memories of his past soon flood his memory). Here his estranged and aged father welcomes him - but his brother's corpse is soon found, ripped up by what seems to be a wild animal. The rumours, speculation and superstition amoung the locals are thinly cloaked, with the blame leveled at the gypsies camping at the edge of town. On visiting their location for answers, a beast strikes, attacking and killing many, also wounding Lawrence. His critical condition seems fatal, but he miraculously recovers. At the next full moon he will discover what he has become - a werewolf, a Lycanthrope, a cursed man turned beast. To add to his woes, Lawrence falls for his brother's fiance', but fears he may harm her. Besides a Scotland yard detective investigating the murders in the area, the townsfolk also have plans of their own to stop the beast. Made very much in an old-school fashion (with modern methods) external scenes often have a studio feel with the forests gaining a surreal quality within a Gothic context, the cold blue palate of the nighttime exteriors contrasting wonderfully with the well-detailed and designed warm interior settings of the Talbot mansion. The drama, urgency and sympathy with all characters seem lacking in contrast with the very impressive special FX, many of the narrative element outcomes expected. Performance-wise Del Toro is always intriguing in whatever role he tackles, while Weaving is hard-pressed to shake his Agent Smith / Matrix persona. In the case of the well-respected and award winning Anthony Hopkins, his lackluster performance feels as though he is merely running through his lines to get it over with. Director Joe Johnston is no stranger to special FX, working for Industrial Light & Magic on various George Lucas and Steven Spielberg productions and going on to direct movies like Jumanji and Jurassic Park III. Unfortunately the aforementioned scare factor does not rate very high here, but the occasional fright succeeds in making some viewers jump. Special make-up FX fans will be overjoyed to know that Rick Baker (who created the breakthrough Oscar winning werewolf transformation make-up for the original American Werewolf In London) turns up in a cameo role. 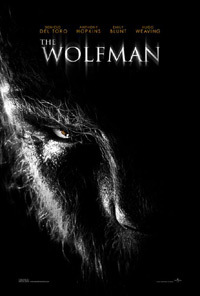 In addition to American Werewolf and taking care of this Wolfman remake (integrated with digital FX), Baker is the man to call for brilliant make-up, be it another wolf flick like Cursed, make-ups for weight (Nutty Professor), age (Ed Wood), race (Tropic Thunder), apes (Greystoke), or aliens (MIB) - the man's talent knows no bounds with multiple awards deservedly on his mantle. We're so impressed with him we inducted him into our South African HORRORFEST Hall Of Fame! 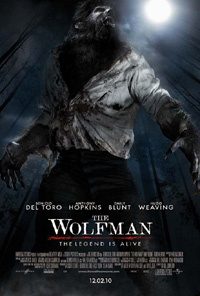 The look of the Wolfman very much emulates the original as opposed to a full wolf transformation. This biped wolfman occasionally leaps into a four-legged trot (to chase down a victim or escape the police across the city rooftops). Naturally at the closing of this film the door is left wide open for sequels, but with the anticipation of this classic tale's retelling, one cannot help but feel just a little disappointed as it falls short of total fulfillment on both a dramatic and horror level. This DVD version is the Director's Cut with around a quarter of an hour extra footage. Some dDeleted scenes are also included.